Home insecticide toxicity Pesticides: more toxic than previously thought? 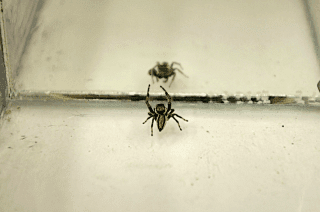 A McGill research team reached this conclusion after looking at changes in the behaviour of individual Bronze Jumping Spiders both before and after exposure to Phosmet, a widely used broad spectrum insecticide. It is a finding with far-reaching implications for agricultural production and ecosystem health. The researchers found that, in general, the behaviour of spiders became more “unpredictable” and individuals behaved less according to their personality type once they were exposed to insecticide. This could be because some individuals are much more sensitive to the insecticide than others. Interestingly, they also found that male and female spiders were affected differently. Males who had been exposed to the insecticide were able to continue to capture prey as they had before, but “lost” their personality type when exploring their environment. Individual females, on the other hand, were much more affected in their ability to capture prey. Read more: Pesticides: more toxic than previously thought? April 14, 2019 - Unintended Consequences Of Insecticides MyMotherLode.com"Unintended consequences" – those situations where we try to create good and the outcome is worse. Recently, my cat required a visit to the vet and, after tests. April 17, 2019 - Fargro launches aphids and whitefly insecticide Horticulture WeekFargro launches aphids and whitefly insecticide - from Horticulture Week. April 16, 2019 - Scheduled aerial insecticide spraying set for sundown at Tyndall AFB WJHG-TVTuesday, more than 25000 acres on Tyndall Air Force Base will be sprayed with insecticide to help prevent insect-borne diseases.